AllegroMedical.com presents The Sennheiser A 200 Personal Sound Amplifier. The Sennheiser A 200 is a personal sound amplifier designed for people who may need assistance with their hearing. The system features a lightweight stereo headset that provides up to 35dB (decibels) of amplification. With stereo amplification via two integrated electret microphones, the user can clearly determine the direction of the sound source within an 8' to 10' radius. 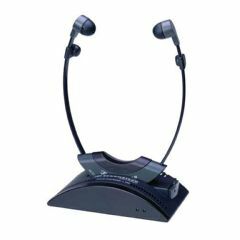 Dynamic headphone transducers ensure natural and transparent sound reproduction with optimum speech intelligibility. The A 200 features an auxiliary audio input for connecting an external microphone or infrared receiver.